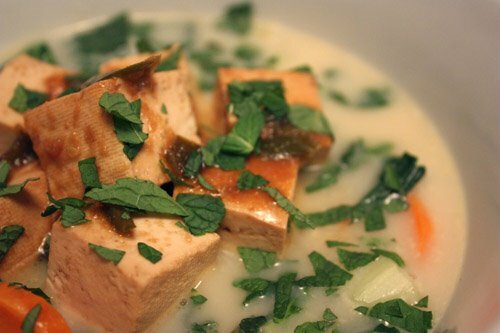 To accompany the chilli rice paper rolls, I also made chilli tofu in coconut broth from the chilli chapter in Flavors . I had to make a couple of substitutions, but I mostly followed the instructions in the book. One issue is that I never seem to find kaffir lime leaves at my grocery store. That seems like something I should be able to find there, but I never do. For the coconut broth, since I was lacking lime leaves, I used some lemongrass stalks from my herb garden instead. For serving, the soup was to have been topped with Thai basil leaves which I’ve grown in the past but didn’t this year, and I didn’t find that at Central Market either. I used chopped fresh mint instead. One last change was using baby bok choy instead of Chinese broccoli. Did I ruin it horribly with these cavalier changes? I don’t think so. The coconut broth was made by warming coconut milk, vegetable stock, and my lemongrass stalks in a deep saute pan. Sweet potato slices were added, the pan was covered, and it cooked for eight minutes. Then, chopped bok choy was added, and it continued cooking for another four minutes. Let me pause, because if none of this sounds appealing at all, just consider cooking some sweet potato in coconut milk. That discovery alone made this dish an amazing experience. When I tasted a piece of sweet potato for doneness, it was really delicious. Next Thanksgiving, I’m thinking the sweet potato dish should absolutely involve coconut milk. Now, back to the matter at hand. Meanwhile, the tofu cubes were sauteed with chillies, soy sauce, ginger, lime juice, and no sugar because I skipped it. I do that. I prefer to let the acidity have its way with the flavor profile. I can’t help it. The finished soup turned out great. The vegetables in the coconut broth were mild, cooked to a softened state, and rich tasting from their time in the flavorful liquid. The tofu cubes sitting on top were spicy and sharply flavored from the chilli sauce. Little by little, the chilli sauce meandered into the coconut broth, and the flavors mixed, and it was all wonderful together. I will make it again for certain, and I will fondly remember this coconut milk and sweet potato rendezvous. That is my all-time favorite kind of meal. I would only add rice noodles and then could honestly eat that meal for the rest of my life. Do you have a Whole Foods near you? they have kaffir lime leaves. I have also used lime zest in a pinch. this isnt working for me anymore - now I want you to simply make if for me and find a way to get it to me - the tofu looks so great and I thought the chilli paper rolls were gonna be tough to beat. 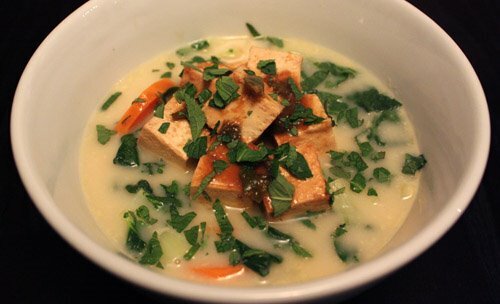 The coconut broth and the sweet potatoes sounds wonderful with tofu. mmm. a coconut-lemongrass broth sounds just right for this time of year. this looks amazing. i always go to the indian grocery to get the lime leaves. they will keep for a while in the fridge so that you can have some for a couple of batches. Dana-- Rice noodles would be a nice addition. I should have checked at WF for lime leaves, but alas, I was lazy. dog-- I'm working on a way to turn a food blog into an automat. I'll let you know when it's up and running. 5star-- Thanks! The sweet potatoes were really delicious. Navita-- Can't help it. I like the spicy stuff. Marc-- That's right, I'd heard before that lime leaves may be in the freezer section. I'll look harder next time. Cate-- Thanks! Good to know the leaves will last a while. Taste-- Tong Yum Kung sounds fantastic! Kaffir lime leaves are not easy to find. A couple of my friends have even taken to growing their own kaffir lime trees to make life easier. They say the trees are easy to care for. Hmmm, even I, who has a black thumb, might have to give it a try then. Yep, coconut milk makes all things good. And sweet potatoes are always tasty. This is guaranteed to be the best. And it probably still feels like a light meal paired with the chili rolls. I love your blog: How have I not stumbled upon it before? I am experimenting with a vegan/vegetarian diet (it fluctuates!) and this sounds like a delicious idea. I knew I liked 'All' your stuff for a reason...are u sure the carrot cookies did not have a spicy flavor or after flavor, lol, I would love that one! This and the spring roll pic back to back are driving me insane, and I just went for a sushi roll (1) the other day, now I want more asian!